Before I get to the good stuff, I want to talk about good stuff. Make sense? So, I told you guys that I did a little damage on Black Friday and Cyber Monday. The sales were too glorious to pass up. Yes, I knocked out most of my Christmas present shopping, but also grabbed a few things for myself, like this plaid fringe cardigan poncho from Forever 21. I know that sometimes I go on and on about a certain piece of clothing, pair of shoes or accessory, but Forever 21 knocked it out of the park with this one. If you buy anything for yourself this month, buy this cardigan (and these boots). It's less than $30. It's plaid (hello). It's cozy. It's warm. Best of all, it's so fun and festive for the holidays! Okay, peer pressure over...well sort of. Today I want to introduce you to an online jewelry store, Peggy Li. Some of the pieces you see may look familiar...familiar as in you saw them on TV shows like Vampire Diaries, Scandal, Castle, Hart of Dixie, New Girl and that's just to name a few. Pretty exciting, right? I am wearing three of her pieces today; the personalized initial necklace, love bracelet and deco ring. When I found out that Peggy Li got her styling start on Buffy the Vampire Slayer, I felt like I was receiving jewelry from a celebrity. You may not know this, but I was OBSESSED with that show and even more obsessed with Sarah Michelle Gellar. Peggy Li makes the most beautiful handmade jewelry that is both feminine and delicate. I literally want every single piece she has created and designed. A few items on my wish list are her arrowhead necklace, dainty feather charm necklace and white stone cuff. Peggy Li not only concentrates on curating beautiful designer jewelry, she is also committed to the environment, recycling, reusing metals and avoiding unnecessary waste. Today, Peggy Li has been gracious enough to offer one reader a leaf stamped personalized necklace (like the one I am wearing) with one 1/2" disc and 18" gold chain (retail value $69). She is also offering 20% off your purchase when you use the code SHANNA20 at checkout. This code is valid through December 10th to ensure orders are received in time for Christmas. Good luck, have a great weekend and happy shopping! Cute poncho! Love the bright colors on you! Such a cute look with the black and red! That necklace is so pretty! Cute poncho and you look radiant and happy Shanna, love these pics. Lovee how your hair looks in these pictures!! So pretty! Shanna - I think I finally figured out how to allow replies to my comments!! Eeek =) .... I love this look today. You are way too cute for words. Shanna!!! I am wearing the exact same outfit today, except not with the cute red boots. I love this poncho, so comfy and warm. Love your style! I still love Buffy! I watch it whenever I catch it on tv. Love that plaid poncho. 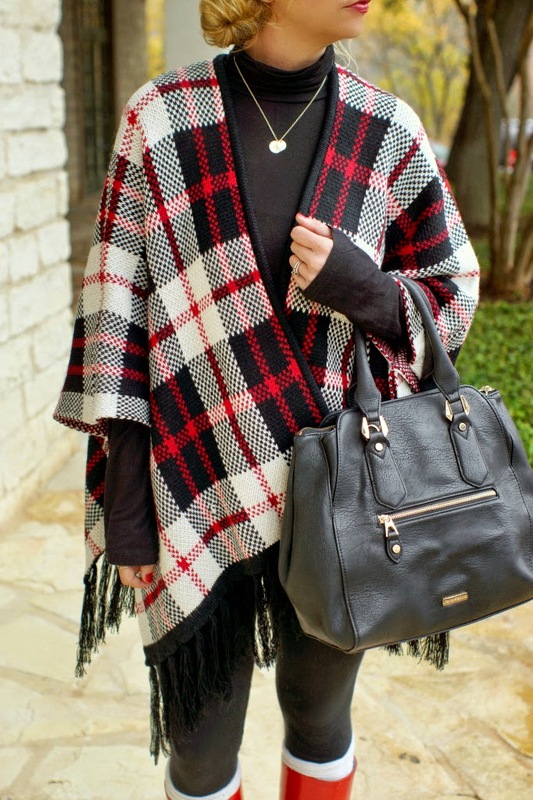 Obsessed with this plaid poncho! I saw your peek on Insta last night and couldn't wait to see the full look today! Adorable! You always make everything look so great! Oh my god Shanna! this is one of my fav outfits you've worn! so cute!! This poncho is too perfect Shanna... absolutely love it! My roommate and I are making our way through Buffy right now! 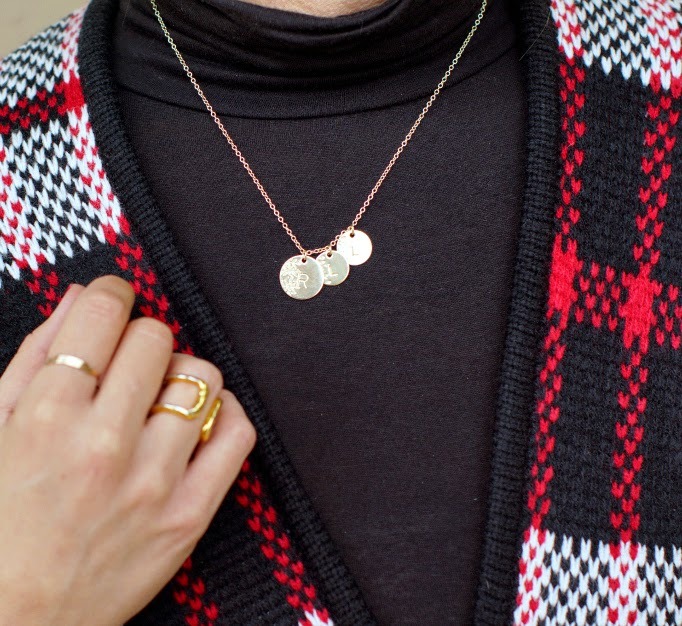 Love the cardigan and the jewelry! SUPER, SUPER CUTE! I love that poncho! absolutely love the cardigan! 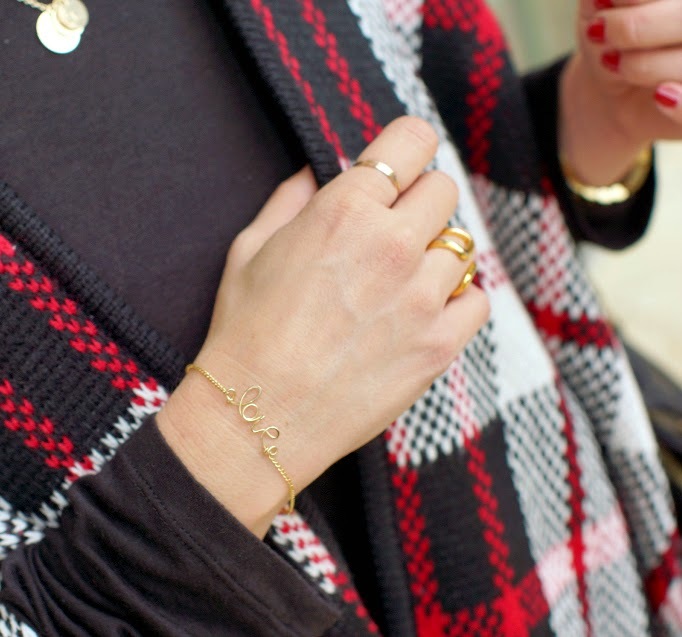 perfect winter style! That poncho is so perfect for the holiday season! Love the red boots with it too! Can't get enough of the ponchos/ruanas and blanket scarfs as outerwear this year! You nailed this look with the rain boots! Love ur jewelry in this outfit too! Hope you are having a wonderful day! Your blog always reminds me that I need to check out F21 more often. I honestly cannot remember the last time I've been in that store! I get frustrated in their sometimes because it's SO big and unorganized, but I need to put a little time aside to scope it out. You find the best stuff there!! Yay!!! I have been wanting a pair of red hunter weliies (and black and green) but the price has kept,e from pulling the trigger. Can't tell you how many times I have put them in my cart only to close the page and not buy. This boot? That price? A LOT less guilt for this momma! Thanks Shanna! What a great holiday look, so pretty! Love your blog....you have good taste!! I blogged on that same poncho a few weeks ago.